Rafaelhoteles Piramides is probably one of the most ideal hotels for your destination trip. 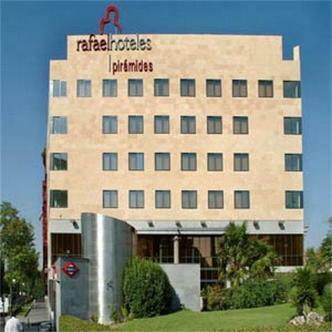 It is situated at only 20 minutes away from the International Barajas Airpor with an easy access to the M-30 and M-40 ring and underground station at the door of the hotel.At walking distance away from the Rastro fleemarket and just a few minutes away from the Royal Palace Plaza Mayor Austrias Madrid and the area will-known as The Culture Mile offering the Prado Museum the Thyssen Bornemisza and the Reina Sofia Art Center.The 84 rooms and 9 sutites are designed and equipped with the latest technologies to offer the comfort for the business or leisure traveler.It offers also its Acuarela Restaurant with a light balanced cuisine and composed by a wide variety of dishes. It also offers you 5 meetin rooms for your success in your events and conventions.